This is my first attempt to make my blog more personal. Since crafts of all kinds are of interest to me, I thought I would invite you to read about the little critter who sometimes helps me to create my projects. Bailey is a female grey cockatiel and in my eyes a sweetie pie. Everyday we watch Ellen and I thought at first she was a big fan of Ellen, just like me. 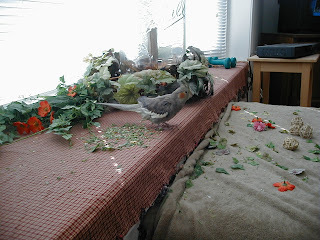 Little did I know, Bailey was using Ellen to distract me while she rearranged the flowers in my bay window. Bailey will call me to let me know it is 10:00 am and time to watch Ellen. Once Ellen is finished dancing, Bailey makes a break for the window. Have you ever showed something you made to, lets say your mother, only to have her say, "well that is nice dear but you should have done it like this"? Well, I have had this happen to me but only to have Bailey first tell me she absolutely loves it. See the above picture of my attempt at flower arranging. Then to let me know in her own way that she wanted to tweek it a little bit, see picture below. Now, I understand this was a lame attempt to make this little vignette but do you like Bailey's any better than mine? All I am saying is, it's all Ellen's Fault. What a fun post and what a great and talented bird! Love it! That is so funny! What a little bugger Bailey is! I enjoyed reading that very much! What a lovely bird. She has her own style that's to be sure! Bailey is so cute!!! Not very talented, I'm afraid, but cute! I am so glad to have found your blog -- thanks for stopping by mine. 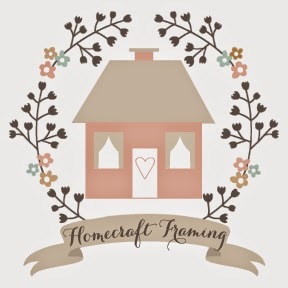 You have some awesome framing information that I will surely use. I have spent a small (no, huge) fortune in framing and really need to start doing it myself. Maybe with your guidance, i'll give it a go! Bailey you are a great side kick and I imagine you keeps things interesting around the house! What fun. 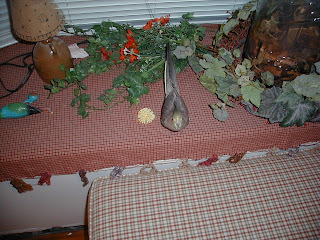 Bailey has a unique and creative way of flower arranging....what a cute birdie! Thanks for visiting my blog and I hope you have a wonderful weekend. Hello across the river! I am so happy to meet a fellow Greater Cincinnati/Kentuckian. We go over to eat at the Greyhound and Cottage all the time...and can't forget the Florence Mall. Your blog is so informative. Love the vintage stitchery you framed. Poor Baily..he tried to put it back the way he found it....but, he doesn't have thumbs! Bailey the florist - I love it! Bailey seems like a sweetie....just an independent thinker! Wonderful Post...beautiful bird..have a fantastic week. Cute! I blogged about birds today too! I would guess that Ellen would send you a Kitty for some feather arranging. lol, Thanks for popping in on my blog and here I am in return. This will often be one of my stops along the way. I do all of my own framing and it is so nice to have the ability to do so. You have your hands full! Cracks me up! What a clever pet and what a fun story to read! Thanks for the chuckle! Awww, Bailey is adorable! We haven't had a bird in a while. I do miss them. Cute! Saw your name over one Springfield Antique's Blog & thought we'd stop by and say "hi!" Maybe she's a Bower Bird. They're certainly artistic. LOL I think I love Bailey! What a character, soo sweet. I just acquired a Young Male Green Cockatiel. After reading many of your posts I truly agree he is a gift!!! Their antics are so amusing, especially in the morning and evening. I have him on my shoulder until he becomes more accustomed to getting on my finger. He seems to have made the transition fine so far and keeps me totally entertained. Keep up the wonderful work & I love reading about Bailey!!! Hillarious, I love it. At first I thought that the Cockatial(sp) was part of the flower arrangement until I realized that it was the source of your frustration. How cute is that. Well, I am sure you didn't find it all that cute but seriously our pets are our own worst critics. heheh.